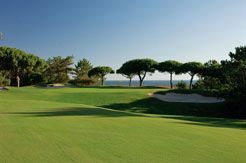 Accommodation: Dona Filipa Hotel, Vale do Lobo on a shared twin room basis (single rooms available by supplement) Format: Three day golf tournament with a celebrity captain each day. Day one @ San Lorenzo followed by all inclusive Barbecue supper, Day Two @Vale do Lobo Ocean followed by dinner at their restaurant, Spikes & Day Three @ San Lorenzo immediately followed by all inclusive Prize Giving Barbecue allowing free time in the evening. 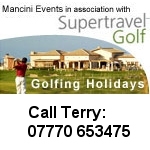 The Cost: £5,850 per team (this includes a donation to charity) 3 shirts for every team member, return flights with British Airways, 3 nights B&B hotel accommodation, 3 rounds of golf, transfers & dinner with beer or wine. The event is currently sold out, however, if you would like to register your interest for the waiting list, please contact Nikki nikki@mancinievents.co.uk 07702 568607.